Writing conferences used to scare me. Big time. In fact, for me, it was the most-dreaded element of reading and writing workshop. How would I even start? What would I say if the student had a question I couldn’t easily answer? Would the other students really be working while I moved around the room discussing individual drafts? Gentle reader, I am here to tell you that practice makes perfect. But I kept at it, and I finally feel truly confident in our daily writing conferences. Uh oh. I have a lot of room to grow. Feeling that nag of something you know you should do (but don’t want to), I dove in (which I find to be the only way to actually try anything in workshop). Which piece are you most proud of and why? Which pieces did you choose to revise again? What did you change? What led you to make those changes? In general, what is going well for you in your writing? What skills or elements of your writing process are you already good at? In general, what is harder for you? What skills are you still trying to hone? What are two writing goals you would like to adopt as we move forward — skills you would like to strengthen, parts of you writing process you would like to work on improving, types of writing you’d like to try, or topics you would like to tackle in your writing? Just like any other day, after the mini-lesson, students wrote and I conferred. We put regular writing conferences on hold for a week so that I could have portfolio conferences instead. Just like a normal conference, I moved around the room to the students’ desks. Often, while we conferenced about their body of work, we also snuck in a couple of moments to converse about their current piece of writing and any questions they had. The length of each conference differed — some students had a lot to say, and some had less to say. Overall, this process took 90 minutes in my largest class, split up over the course of four class periods. 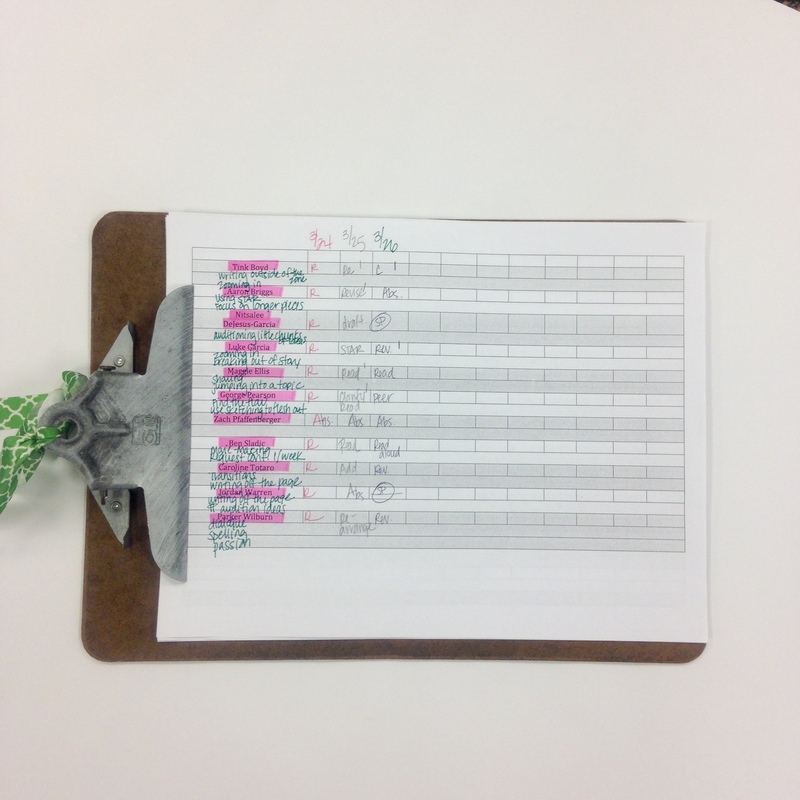 I recorded students’ goals on my current conferring chart. I have had students make writing goals in the past. They weren’t often all-that-stellar, probably because they happened in isolation rather than in a conversation with me. They also lacked meaning because we never intentionally followed up on them. I have asked students at the end of the year to reflect on how they met their writing goals, but because we haven’t revisited the goals frequently, many students didn’t even know which goals they had previously identified! In summary, it was a waste. 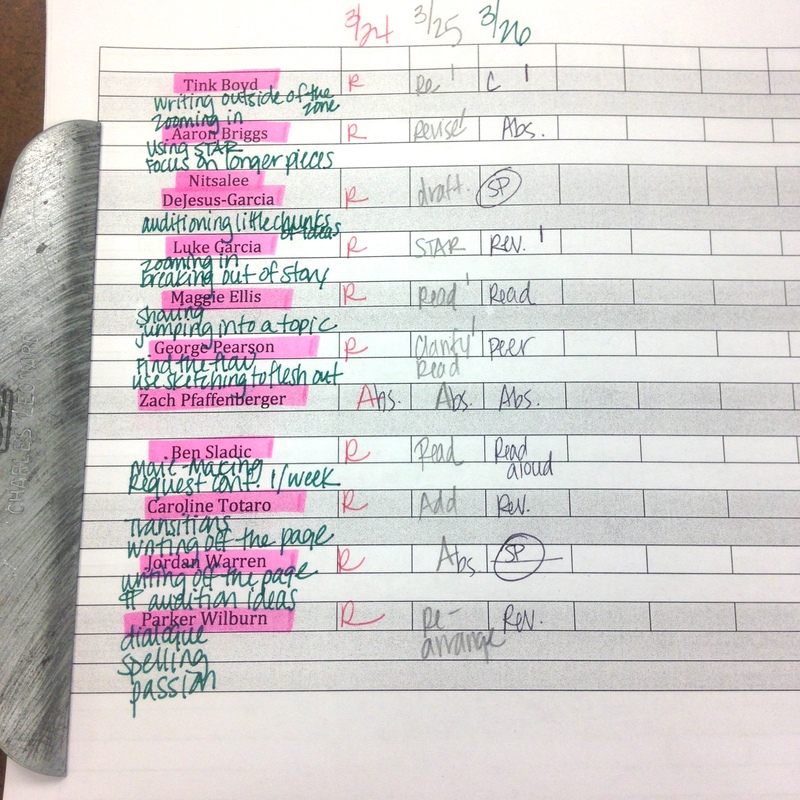 In my portfolio conferences, students’ goals varied widely. Some students made it a goal to break away from the topics toward which they naturally gravitate and to try new things. Other students wanted to specifically focus on their grammar as they progress. 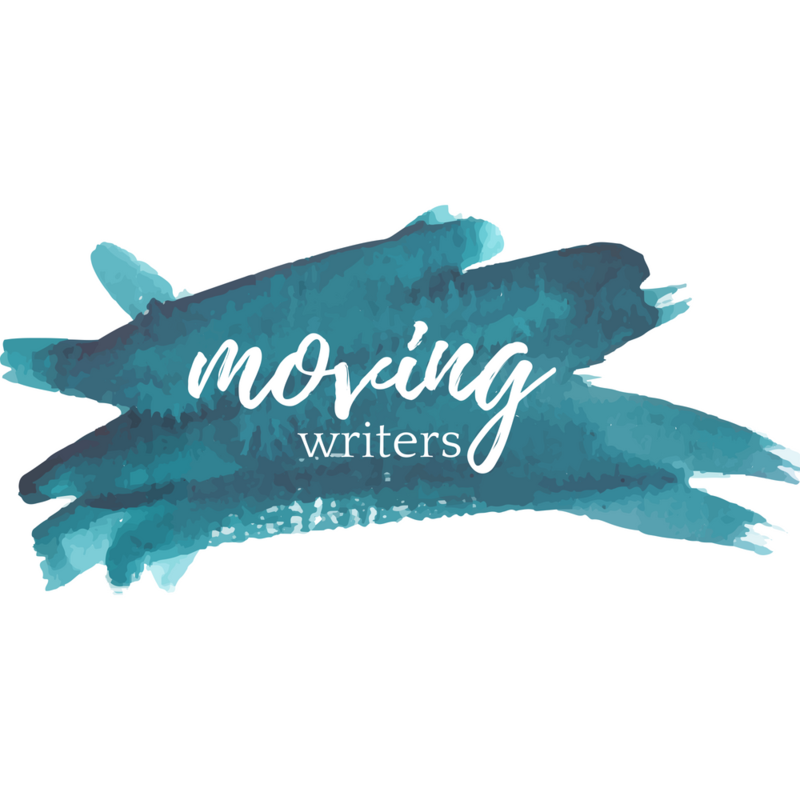 Still others made it a goal to request a writing conference with me at least once per week, to intentionally walk through the STAR revision method as they finish pieces of writing, to audition a few ideas before they settle on one. I wrote these goals on my current conferring chart that I carry with me during workshop each day. By recording students’ goals on my current conferring chart, I can quickly see students’ goals and chat about them periodically during writing conferences. This can now become a focus of our conversations about writing rather than a tangent we all quickly forget about. Students then took this conversation on the road and led a writing conference at home with their parents. After students practiced with me and identified goals moving forward, I wanted them to share with a parent. In my class, we don’t have quizzes with As brandished across the top that students can quickly show parents and pin to the refrigerator. I want parents to see their student’s work — their growth, their progress. Workshop is also something that few parents have personally experienced or understand. Having their child show them their writing process, their products, and talk about their goals is an important PR moment for our classroom life. We all win when parents see their student’s skills explode and get a glimpse of what workshop can do. I advised my students to simply walk their parents through the same conversation we had. I gave them a letter to give their parents briefly explaining the exercise, and parents provided some written feedback and a signature verifying that an at-home writing conference had happened. They didn’t take as long as I feared they would. I learned a lot about how my students view writing workshop and their own progress as writers — far more than I ever learned when I had them write reflections at the end of the year. We developed useful, meaningful goals on which I think I can actually follow up. 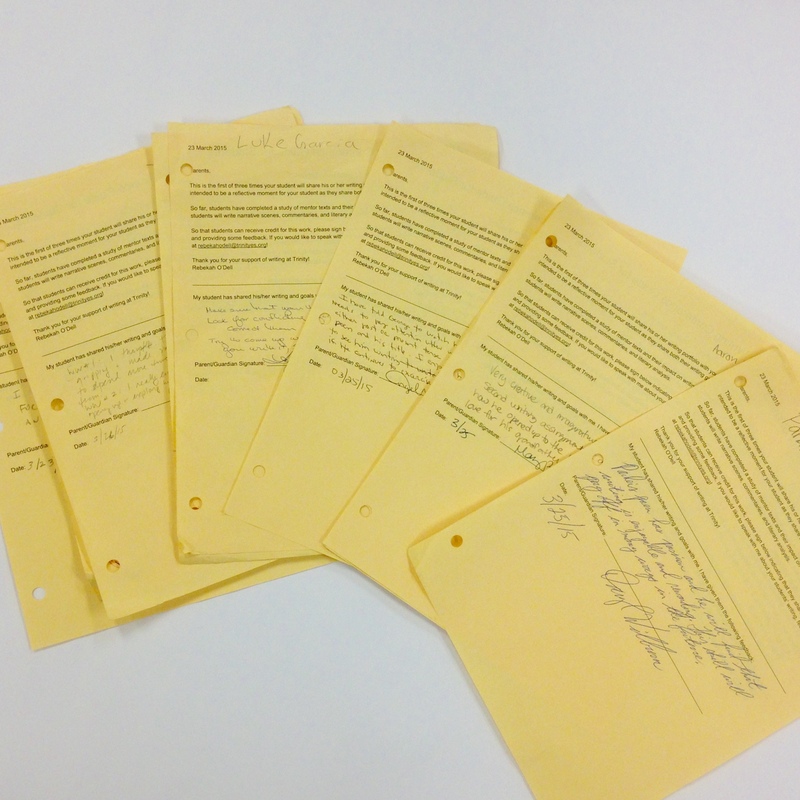 Students talked to their parents about their writing work and got feedback. I learned more about my students’ parents and what they are looking for in their child’s writing experience. In the future, I will give parents a bit more guidance on the kind of feedback I would like for them to offer their writer. I think some thought they should be instructional (“I instructed Jack on different sentences structures…”) rather than reflective. I will absolutely do these again, continuing to practice this kind of conference, smoothing out my process, and deepening the product. I’ll practice and practice and practice until I feel as comfortable here as I do in my daily, minute-by-minute writing conferences. Practice is the only way my students become better writers; it’s the only way I become a better teacher. What are the different kinds of writing conferences that happen in your class? Have you ever had students lead writing conferences at home? What happened? What parts of your conferring need the most practice? Let’s continue this conversation — leave a comment below or find us on Twitter @rebekahodell1 and @allisonmarchett. Nice suggestions. You could make the batter harder by reducing the tomato and the onion. Actually we made bajiya without tomato and onion and they turned out like the Egyptian ta;ym217&a8i#a. The Egyptians have a famous sandwich made of ful and ta’amiya. We also like to add roasted eggplant to the wrap, it’s delicious. Thank you for the question. A breakthrough for us was the power of small group writing conferences. It seemed like moving one writer a time took up so much time (and with 47 minutes for writing we were StUcK). So while not abandoning one-on-one conferences, we started looking for patterns across students, whether they were similar goals, similar needs, or just some friends who wanted to work together. What we found was that we could get through two group conferences a day and three one-one conferences. That was 11-13 kids a day! With time constraints such as ours, we found power there. Getting better at meeting group and singular needs is always a top priority for us. Thanks for reading, Coaches! 😉 Group conferences are incredibly powerful and efficient — you’re right. Especially for the day-to-day, in-the-thick-of-the-writing conversations we have. In any given writing study how often do you do small group conferences? All the time? Once or twice? So the goal (GOAL!!) is to meet with everyone weekly. So, if that’s through small groups or individual conferences, we really do try to hit everyone once a week. Small groups makes that possible (because that’s seeing 2-3 groups/day for about 4 days). Our units usually last 4-6 weeks, so in a perfect world, we’re seeing several groups per week, so in total we would see a kid either in a group or during an individual conference 4-6 times during a unit. And the reality is pretty close to that. Our teachers have gotten super great at the small group conferences and very efficient in their individual conferences. So, with the goal of 4-6 times, they’re making seeing kids 3-5x per unit for in-depth small group work or individual conferences. They rock our socks off.